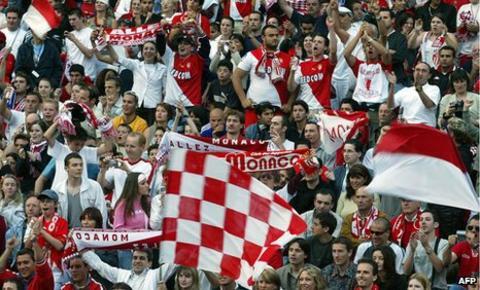 Billionaire Russian businessman Dmitry Rybolovlev has bought a majority stake in AS Monaco. The seven-time French champions are in the second division but Rybolovlev has pledged to invest at least 100m euros (£84m) over the next four years. "I am a passionate football fan," said the 45-year-old. "I think this club has enormous potential. I hope it can now realise this potential, both domestically and in Europe." The Russian, who is ranked 93rd on the Forbes list of billionaires, has acquired 66.67% of Monaco. He sold his stake in fertiliser producer Uralkali for $6.5bn (£4.1bn) in June 2010, his net worth is estimated at $9.5bn (£6.1bn), and he bought American businessman Donald Trump's Palm Beach mansion for $100m (£64m) in 2008. The new owner faces a huge task to revive Monaco's fortunes. The club won the last of their French league titles in 2000 and were Champions League runners-up in 2004, losing to Jose Mourinho's Porto. An 18th-place finish last season saw the club lose their place in the top flight and Rybolovlev may have to start spending immediately with Monaco now in danger of a second successive relegation. They are bottom of Ligue 2 with 13 points from 18 games. Rybolovlev, who has been elected president of the board of directors, added: "Having lived long enough in Monaco, I realise the club is not just one of the principality's sports teams but also represents one of the main symbols of the principality, its pride and traditions." Prince Albert II, Monaco's head of state, welcomed the deal. He said: "The agreement opens a new page in the history of the football team so dear to the principality. "I hope the club can rediscover its former prestige which made it one of the jewels of Monaco's sporting life." Rybolovlev is one of the small group of Russians such as Chelsea owner Roman Abramovich who became fabulously wealthy during the post-Soviet privatisation of the economy and are known as oligarchs. It is the second time this season there has been a high-profile, big-money takeover of a French club after Qatari investors bought Paris St Germain in August.